WHERE DID THE DISCIPLES GO? Mat 28:20 Teaching them to observe all things whatsoever I have commanded you:and, lo I am with you always even to the end of the World. Amen. The word “Nations” means heathen or foreign nations or races. The translation should say ALL RACES. G1484 ἔθνος ethnos eth’-nos Probably from G1486; a race (as of the same habit), that is, a tribe; specifically a foreign (non-Jewish) one (usually by implication pagan): – Gentile, heathen, nation, people. Christ had chosen Paul for a threefold purpose – “to bear [His] name before the Gentiles, and kings, and the children of Israel” (Acts 9:15). Also Paul had planned to go to Spain and may have gone to Britain. “I will come by you into Spain” (Rom. 15:28). (book i, on Psalm cxvi. p. 870). Paul ministered in southern Galatia, he was not allowed to minister in other areas by the holy spirit. “After they [Paul and his companions] were come to Mysia, they assayed to go into Bithynia: but the Spirit suffered [permitted] them not. And they passing by Mysia came down to Troas” (Acts 16:7, 8). “Peter, an apostle of Jesus Christ, to the strangers scattered throughout Pontus, Galatia, Cappadocia, Asia, and Bithynia” (I Peter 1:1). Notice the word “strangers.” It does not mean Gentiles. The original Greek is parepidemos. It means “a resident foreigner,” literally, “an alien alongside. G3927 παρεπίδημος parepidēmos par-ep-id’-ay-mos From G3844 and the base of G1927; an alien alongside, that is, a resident foreigner: – pilgrim, stranger. “But then the entire body of the people of Israel [the Ten Tribes] REMAINED IN THAT COUNTRY [they did not return to Palestine]; wherefore there are but two tribes in Asia and Europe subject to the Romans, while the ten tribes are beyond Euphrates till now, and are an immense multitude, and not to be estimated by numbers” (Antiq. of the Jews, bk. xi, ch. V, §2). “… many conquered peoples were removed to other homes, and two of these became very great colonies: the one was composed of Assyrians and was removed to the land between Paphlagonia and Pontus, and the other was drawn from Media and planted along the Tanais (the River Don in ancient Scythia – the modern Ukraine, north of the Black Sea, in southern Russia).” See book II, §43. Notice the areas from which these colonies came – Assyria and Media. The very areas to which the House of Israel was taken captive! Strabo called these people the “White Syrians” (12, 3, 9), instead of Assyrians. Who were these so-called “White Syrians”? None other than the House of Israel which had been carried into Assyrian captivity. 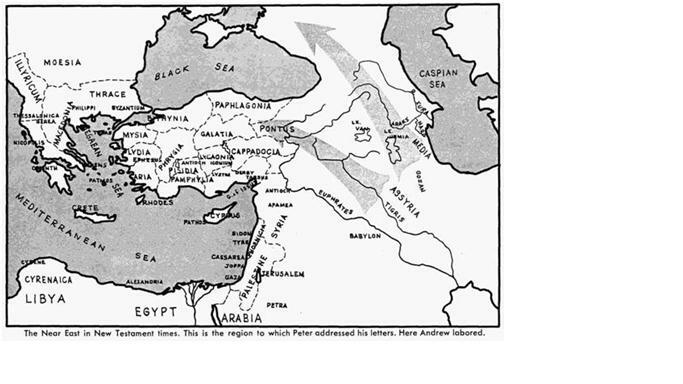 “Syria” was the Greek name for the whole eastern Mediterranean coastal strip north of Judea. That is why the Greeks called them the white Syrians. Andrew went to Scythians. Andrew had Scythia, and the neighboring countries primarily allotted him for his province. Dorotheus was a bishop of Tyre (255 A.D.) is credited with an “Acts of the Seventy Apostles” which may be the same work as the lost Gospel of the Seventy. (Historia Regum Britanniae, bk. xi, sect. 8, 10). The Universal History is a 65 volume account of history form the earliest times. It is compiled from original authors, and illustrated with maps, notes and published in London between 1747 and 1768. Universal History explains the Nordics were white people who came from North Africa and Mauritania. (Cave, Antiquitates Apostolicae, p. 148 ). In 256 A.D. Parthia began to migrate from the regions of the Black Sea to Denmark, thence into the British Isles in 449 A.D. The Greek historians reveal that Thomas brought the gospel to Parthia. “Parthia, after which Sophornius and others inform us, that he preached the gospel to the Medes, Persians, Carmans, Hyrcani, Bactrians, and the neighbor nations”. These lands we know today as Iran (or Persia) and Afghanistan. Parthia was defeated by Persia in 226 A.D. Expelled from Parthia, the Ten Tribes and the Medes moved north of the Black Sea, into Scythia. (See R. G. Latham’s The Native Races of the Russian Empire, page 216.) From there, around A.D. 256, the Ten Tribes migrated with their brethren from Asia Minor into Northwest Europe. “White Indians” – that is, whites living in India – were also known as Nephthalite Huns, in later Greek records. They were overthrown in the sixth century and migrated into Scandinavia. Bartholomew worked with Thomas in the Parthian Empire. According to Nicephorus recorded that Bartholomew also spent part of his time in Armenia and Upper Phrygia in Asia Minor. Nicephorus called the area the “Western and Northern parts of Asia,” . (Asia Minor, modern Turkey today). Jude, his other name was Libbaeus Thaddaeus, had his ministry in Assyria and Mesopotamia. That is part of Parthia Empire also. All lands north of the Eurphates River belonged to the lost tribes of Israel according to Josephus. During the New Testament times, Parthia ruled most ruled over most of the Gentiles. Part of their possession was Assyria and Mesopotamia. They controlled the famous city of Babylon. Ethiopia and Greek sources tell us Matthias went to Dacia. Dacia is modern day Romania and Macedonia. sources designate Dacia. Dacia was the extreme western part of Scythia. From Dacia came the Normans who ultimately settled in France and Britain. Hello there, simply changed into aware of your blog through Google, and found that it’s truly informative. I’m going to be careful for brussels. I will be grateful when you proceed this in future. Lots of folks will probably be benefited out of your writing. Cheers! up here WHERE DID THE DISCIPLES GO? | History of the Twelve Tribes of Israel. And I actually do have a few questions for you if you don’t mind. Is it only me or does it look as if like a few of these responses come across like coming from brain dead folks? 😛 And, if you are writing on additional sites, I would like to keep up with anything fresh you have to post. Could you make a list of all of all your shared pages like your linkedin profile, Facebook page or twitter feed? Hey Michael, Thanks for listening. I have not gotten into facebook. I have a facebook account have not taken time to start using it. Maybe soon. I will let you know. I like your blog. trying to write a song about Ruth & Naomi. Brought some light & am thankful to your this. Please continue in your research & may Yahveh guide you. thanks glad you are enjoying these teachings. thanks for listening. What’s up,I log on to your blog named “WHERE DID THE DISCIPLES GO? | History of the Twelve Tribes of Israel” regularly.Your humoristic style is awesome, keep it up! And you can look our website about proxy list daily. did the desciples reach out to non whites in their travels? Did they spread christianity to blacks and others on the African, Asian and continents? When you study the history of China someone taught them Torah. Their is a ton of evidence about how they knew who King David was, they have found painting in China of King Solomon. Someone taught them but the 12 tribes were send primary to certain locations to teach. Thanks for the info, i find it really useful. One information which i find it amazing it’s: “From Dacia came the Normans who ultimately settled in France and Britain” Can you please give the source of this info? I would love to search it more. No thank you for listening. Sorry I am so late getting back to you!